KENT, Wash., December 18, 2017 – OMAX Corporation announced it began shipping its ProtoMAX product to customers. 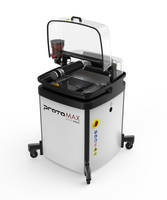 The new ProtoMAX abrasive waterjet is a compact, self-installed cutting system ideally suited for prototyping and relatively low volume cutting of almost any material around 1" thick. The system brings all the versatility benefits of large abrasive waterjet cutters in a sleek and economic package that is perfect for small job shops, engineering classrooms, makerspaces and personal use. It is also a handy addition for large shops and fabricators that need occasional waterjet capabilities to complement their other cutting systems. OMAX manufactures the ProtoMAX at the OMAX facility in Kent, Washington, and all parts are designed to work together as a complete, integrated system. Customers placing orders can expect the ProtoMAX to ship within two to four weeks. Those interested in purchasing the ProtoMAX should place orders directly on www.protomax.com. The site includes design ideas, specifications, frequently asked questions and a community section to support ProtoMAX enthusiasts.